MOVE IN READY STARTER OR RETIREMENT HOME! • 900 sqft , 1 bath , 3 bdrm single story – FOR SALE CAD142,900 . PERFECT STARTER HOME OR RETIREMENT HOME! 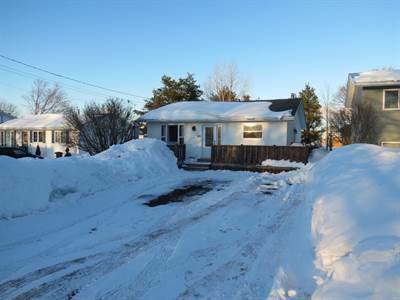 This lovely home sits in a lovely area of Shediac which is walking distance to schools, amenities and the beautiful Shediac Bay! This bungalow has a double paved driveway and good size backyard which backs on the walking trail. Inside you will find a lovely eat-in kitchen, spacious living room, 3 good size bedrooms and 4pc bathroom on the main floor. The lower level is finished with a large living room-play room and another room used as an office or bedroom (window does not meet Egress). Many updates have been done in recent years including, the installation of mini-split heat pump and air exchanger (4years), new roof windows and doors (3years), painted throughout, new flooring in kitchen and bathroom plus some new light fixtures. Heating is a forced air oil furnace and mini-split heat pump. This is a great ready to move in home at a great price! Call today to schedule your visit before it’s gone!